The portoman era coincided with Radioactive Sparrow’s busiest ever year for gigs, playing about twenty shows throughout the year (recordings of most of them survive), which for a band like this was like a world tour. They were therefore more in touch with their craft than at any other time in their history, and it really shows on this album. Following the excitement (and record sales) of Rockin’ On The Portoman, the trio went back into the Hut the following month, and at some stage clearly made a decision to pare materials down to a straight-ahead, unfussy guitar-bass-drums combo, the fabled ‘power trio’ of yore. Made in one day but with plenty of breaks, Old Fruit has a sharp immediacy that bristles with energy and workmanlike efficiency. This was partly due to the technology. The old Tascam 244 that had been used for the previous outing was out of action due to the control buttons having been pressed too hard by over-zealous fingers (Tony Gage has a reputation in this); the machine had to be sent to Swindon for a job turn-around of some 3 months, so a new, cheaper Porta01 was bought. The Porta01 was a much simpler machine and so ambition was scaled down accordingly. 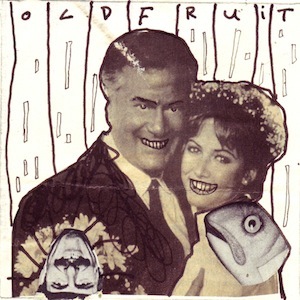 Because of the sensation that the previous album had, on a miniature scale of course, caused, Old Fruit always felt like an afterthought, a bit like one of those contractual-obligation affairs where the band’s full attention isn’t engaged. With time though, it comes over now as possibly the better of the first two portoman albums – the pared down instrumentation and clinical execution making for a much less contrived endeavour. The straight ahead riffing of the opener, ‘The Shops,’ gives the impression that the band are seeking to deliver another Portoman, not least given Gage’s revival of the Cliff Williams single-note bass line from that album’s ‘Sarah Jane Takes The Reigns.’ But ‘Pisces’ seizes the initiative and bombs off in an utterly new direction, Gage’s frantic vocal screaming out the tabloid horoscopes over absurdly forthright drumming from Bargefoot, and Stews’s garment-caught-on-hook guitar. ‘Fierce Desyer,’ played here for the first time, was to become one of a handful of songs that the band would regularly drop into otherwise completely new material on stage, a custom whose logic wasn’t as obvious as deploying a safety mechanism; rather it revealed a natural extension to their total-improv ethos, which has no scruples about wanton self-contradiction. The band were also revisiting the Birthday Party oeuvre on van rides to shows around this time, something that is evident in the tendency to use the multi-tracking opportunity to do a second, distinct vocal take, usually without monitoring the first, along with pursuing subtly monster reverbs, mic’ing the drums by taping a Shure Unidyne-B to the body of an upright piano with the front panelling torn off. Old Fruit is terse and to the point. Within the overall Sparrow narrative, especially in the context of the Portoman era, it remains as a moment of relative clarity in an otherwise tangled succession.